Every year for Christmas I receive at least one new type of root beer from my family. It’s a pretty safe bet on their part that if they give me a new glass bottle brew, I’ll be thrilled. About four years ago my sister gave me a six pack of this. She picked Zuberfizz because it had such a funny name. I must admit, it is a pretty funny. I imagines that it must be zuber fizzy with a name like that. It’s made by Durango Soda Company and has a simple yet attractive label with some catch phrases including “Feel the Fizz!” as the official flavor text plus some of the standard “classic” and “draft” and whatnot. The Body is very crisp and clean with all of the right flavors in the right proportions. Love that cane sugar. The Bite is very mild. It is a nice and smooth brew. The Head is a little weak but frothy and lasts. You can “feel the fizz” to the end. The Aftertaste is sweet and creamy that lingers just the right amount. Yum! I really like it. Also, I find that it is zuber fizzy and I can feel it. Congrats on that Zuberfizz! It could be better of course but this is a solid brew worth getting more of. My sister, of course, was extremely happy that I loved it and that I gave it the Seal. I even had four bottles of this at my official launch party for the updated and improved website. See how it rates against other root beers. 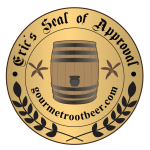 Wow, you actually gave this a seal of approval? I’m a bit surprised, because this root beer is just alright – nothing spectacular. I’d give it a 77 out of 100 just because it’s root beer. I like it. Everyone’s tastes differ. It’s got that creamy vanilla caramely flavor that I love. If 4/5 is converted to your scale, that’s 80/100 so I really only gave it slightly higher marks than you would. I saw it at my HEB store so I got some ! I give it a try this Labor day weekend!